The world of brands is changing: people are actively looking for brands that support their own values, brands that create shared value instead of one-sided profit for the company only. On September 3, 2015, I had the honor to facilitate the Winning by Giving event in Utrecht, the Netherlands. This blog-post shares the key outcomes of this inspiring event. Inspiring speakers Christophe Fauconnier (Innate Motion), Ronald van den Hoff (Seats2Meet, Society 3.0) en Nick Davies (Neighbourly.com) each shared their vision of what’s needed for brands and companies to be successful by contributing to society. The key conclusion of the event was that brands only succeed if they contribute to something that really matters in society. To have impact, brands need to be designed differently; with a business model that creates shared value for both the company and society. In the new reality for brands, it is key for consumers and customers to contribute to the creation of shared value – as people. Important trends to take into consideration in such contributive design are the reduced importance of ownership, the power of connection between diverse people, the internet of things, the growing importance of cities and virtual platforms for collaboration. Even in this globally connected world, life is local. This can be threatening for global brands, but it also provides opportunities for those brands that manage to find local relevance and connection. Online platform Neighbourly supports brands like Starbucks and Marks&Spencers with such connections in the UK. At the event, they also announced the launch of Neighbourly Netherlands. After the presentation by the speakers nearly 100 participants worked together using the Shared Value for Brands model to hack such societal issues as the influx of refugees, cohesion and tolerance in communities and health and nutrition for all. 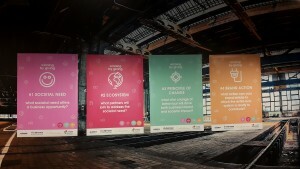 Winning by giving is an initiative by Innate Motion, The Terrace and De Hollandse Meesters, in collaboration with Dutch Marketing Association NIMA. For more information and pictures, check #winningbygiving on Twitter.